This article is about an episode of The Super Mario Bros. Super Show!. For the Japanese arcade game entitled Donkey Kong: Jungle Fever, see Donkey Kong: Jungle Fever. 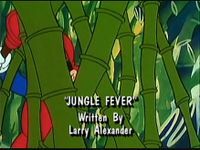 "Jungle Fever" is the eleventh episode of The Super Mario Bros. Super Show!. Its corresponding live-action segment is "Dance". In the Amazon Jungle, Mario, using a plunger to swat his way through a variety of flora, leads Luigi, Toad and Princess Toadstool in their search for Dr. Sheldon, a mysterious witch doctor. After swatting through a large wall of bamboo, Mario, Luigi, Toad and Princess Toadstool find themselves in a large clearing, with Mario inquiring if he can stop and take a lunch break. After Princess Toadstool reprimands Mario, saying he's already eaten three guavas, four breadfruit and two bananas, Luigi asks why they are searching for Sheldon anyways. Toad and Princess Toadstool respond to Luigi's question by saying that Sheldon is the best witch doctor there is and that he may be powerful enough to create a potion that will remove King Koopa from Princess Toadstool's kingdom. After being told all this by Toad and Princess Toadstool, Mario decides to cancel his lunch break and begins to hack at some nearby brush with his plunger. As Mario, Luigi, Toad and Princess Toadstool leave the field their in, three Spear Guys, who were spying on them, leave as well. Afterwards, the three Shyguys reach a towering treehouse and report to their master, King Koopa, that Mario, Luigi, Toad and Princess Toadstool were searching for Sheldon, who they planned on having create a potion to defeat him. After the Shyguys tell him this, King Koopa forms a plan to help him stop Mario, Luigi, Toad and Princess Toadstool from reaching Sheldon. In the Amazon Jungle, Mario is still hacking through plants with his plunger as Luigi asks how much further it is until they reach Sheldon's village. To answer Luigi's question, Princess Toadstool looks at a map and tells Luigi that the village is close by. After Princess Toadstool tells Luigi this, Toad, after walking a few feet, accidentally walks off the edge of a cliff and is left grasping at a vine, yelling for help. As Mario, Luigi and Princess Toadstool rush to the edge of the cliff, Toad, using the vine he is hanging on to, manages to pull his self up to them. After Toad pulls himself out of George's Gorge, as the gorge is called, Princess Toadstool reads on her map that the gorge is at least three miles deep; this information disheartens Luigi, who says that maybe they should stop their journey to find Sheldon and just turn back. Mario, disregarding Luigi's comment, points out a nearby, rather dangerous looking rope bridge, which can be used to cross George's Gorge. Saying that there is no warning sign on the bridge, which Mario tests to see if it is solid, Mario beckons Luigi, Toad and Princess Toadstool to cross the bridge with. Nearby, King Koopa begins to mock Mario, Luigi, Toad and Princess Toadstool, revealing that he took the warning sign for the bridge. After saying this, King Koopa turns to the Koopa Pack, which consists of several Albatoss, Bob-Ombs and Shyguys and orders them to attack Mario, Luigi, Toad and Princess Toadstool. On the bridge, Mario, Luigi, Toad and Princess Toadstool have just started to cross George's Gorge, with Luigi and Toad being somewhat fearful of falling down into the gorge, which is filled with jagged rocks and rushing water. As the bridge begins to swing and sway, Luigi begins to tell Mario that it isn't too late to turn back; it is only when Luigi says this that Mario notices King Koopa and his Shyguy henchmen at the back of the bridge. Taunting Mario, Luigi, Toad and Princess Toadstool, King Koopa has one of his Shyguy minions cut a rope of the bridge with a machete, which causes the bridge to break, sending Mario, Luigi, Toad and Princess Toadstool plummeting into the canyon below. Fortunately, the bridge, the other end of it still being attached to land, simply swings over to the other cliff face of George's Canyon, with Mario, Luigi, Toad and Princess Toadstool hanging on to it. Mario, optimistic, says that all that he, Toad, Luigi and Princess Toadstool need to do is use the bridge as a ladder to climb to the other end of George's Gorge. Unfortunately, before Mario's plan can be enacted, Luigi points to several incoming Albatoss carrying Bob-Ombs; under the orders of their leader, the Albatoss drop their Bob-Ombs directly on to Mario, Luigi, Toad, though they miss Princess Toadstool. 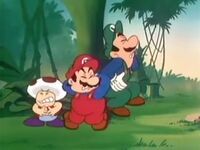 Mario, Luigi and Toad furiously scratch themselves after being hit with Koopa Strength Itching Powder. Instead of exploding though, the Bob-Ombs simply release a white powder, which King Koopa reveals is Koopa Strength Itching Powder, which will make Mario, Luigi, Toad and Princess Toadstool itch so much that they will eventually lose their grip on the bridge and fall into George's Gorge. As King Koopa leaves to get to Sheldon, Mario, Luigi, Toad and Princess Toadstool, itching non-stop, notice several Albatoss brandishing Bob-Ombs approaching. As Mario begins to scratch himself, he notices a particularly big Albatoss approaching from below. As the Albatoss nears, Mario jumps onto its back and, after threatening the Albatoss, has it allow his friends on it's back. After the Albatoss picks up Toad, Luigi and Princess Toadstool, Mario commands it to bring him to Sheldon, which the Albatoss reluctantly does. Down in the Amazon Forest, King Koopa, who is being carried by his Shyguy henchmen and being guarded by several Birdo, begins to gloat about his evil plan. As King Koopa continues to gloat, he is interrupted by a Shyguy, who points-out Mario, Luigi, Toad and Princess Toadstool, who are riding the Albatoss overhead. King Koopa, enraged, begins to brutalize his minions before commanding a nearby Birdo to fire an egg at Mario, Luigi, Toad and Princess Toadstool. Doing as it's told, the Birdo fires an egg, which splatters all over it's Albatoss target's face. The Albatoss, blinded, begins to plummet to the ground and crashes into several trees, throwing Mario, Luigi, Toad and Princess Toadstool off it's back. Princess Toadstool, having been knocked unconscious by the crash, wakes-up to find Mario, Luigi and Toad scratching themselves crazily, being almost unable to move due to King Koopa's Koopa Strength Itching Powder. Elsewhere, in a tree-top village, several Toads are in the midst of crowding around a large hut atop a tree. Suddenly, a man wearing a large, wooden mask leaps from the treehouse and begins to dance as a nearby native named Butterfingers sets down several stools. Eventually finishing his dance, the man removes his mask, revealing himself to be Sheldon; giving his mask to Butterfingers, Sheldon calls forward a nearby, yellow-capped Mushroom native. As the native sits on a stool, Sheldon begins to ask him a series of questions, such as if he ran around the village seven times backwards, drank a blue potion, swam in a pink potion and danced The Funky Chicken on top of a grass hut. Answering yes to all these questions, the Mushroom is told by Sheldon that he is cured of whatever ailed him. After sending the Mushroom away, Sheldon calls upon Butterfingers to send him his next patient; after saying this though, Sheldon notices King Koopa and several Shyguys before him. As all the nearby Mushrooms flee, King Koopa sends his Shyguy minions after Sheldon, who they wrestle into a sack. After the Shyguys grab Sheldon and begin to run-away carrying him, Butterfingers proclaims that Sheldon has been kidnapped. Hearing Butterfingers' yell, Princess Toadstool, upon seeing the Shyguys run frantically with the captured Sheldon, tells Mario, Luigi and Toad to help save Sheldon; unfortunately, Mario, Luigi and Toad are too preoccupied with scratching themselves to do anything. Seeing Mario, Luigi and Toad scratching themselves crazily, King Koopa taunts them, saying that, while they're busy scratching themselves, he'll have Sheldon create a bad potion for his own, personal use. After King Koopa has fled from the village, Princess Toadstool has Butterfingers try to make a No-Itch Potion for use on Mario, Luigi and Toad. Unfortunately, Butterfingers fails to create an No-Itch Potion and succeeds only in creating several more potion-filled cauldrons. As Butterfingers begins to give-up hope of ever creating a batch of No-Itch Potion, Princess Toadstool, frustrated, decides to leave to save Sheldon from King Koopa herself. On a large, stone structure in the Amazon Jungle, King Koopa is in the midst of telling Sheldon, who is still in the sack and surrounded by two Piranha Plants, to make him a powerful potion. It is only after King Koopa threatens to feed him to the two Piranha Plants that Sheldon decides to create a potion for King Koopa and, removing himself from the sack he was in and grabbing his sack of ingredients, begins to create a potion in a nearby cauldron. Pouring several ingredients into the cauldron, Sheldon succeeds in creating a potion, which releases a large amount of white smoke. Down below King Koopa's stone base, Princess Toadstool, having traveled through the Amazon Jungle, notices something following her. Turning around, Princess Toadstool finds that Butterfingers has followed her through the Amazon Jungle, wanting to help her save Sheldon from King Koopa. After thanking Butterfingers foir her aid, Princess Toadstool is pointed-out to some of the white smoke produced by Sheldon potion, which is emanating from King Koopa's structure. Atop the stone structure, Sheldon is in the midst of adding a variety of ingredients to his potion, which includes everything herbs to four left legs from a right-handed centipede. King Koopa, having become irritated by the amount of time it is taking for Sheldon to create a potion, accuses him of stalling him. After being accused of this by King Koopa, Sheldon reassures him that the potion is completed. From behind a nearby pillar, Princess Toadstool and Butterfingers, the latter who is shocked to see Sheldon willingly working with King Koopa, look onward. Suddenly, a Cobrat emerges from a nearby jar, scaring Butterfingers and Princess Toadstool out from behind the pillar and directly in front of King Koopa. After being spotted by King Koopa, Princess Toadstool and Butterfingers try to flee from him, only to be surrounded by several of King Koopa's Shyguy minions, who are brandishing spears. Forced back by the Shyguys, Princess Toadstool is taunted by King Koopa, who commands Sheldon to throw his potion on Princess Toadstool, expecting it to transform her into stone. Receiving this command, Sheldon cheerfully grabs a bucket and puts some of his potion in it as Butterfingers call him a traitor and says she resigns as his assistant. Ignoring Butterfingers, Sheldon throws the bucket of his potion forward, though not before telling Princess Toadstool to duck; doing as Sheldon tells her, Princess Toadstool bends forward, allowing Sheldon's potion to hit the nearby King Koopa, who, after being hit by the potion, falls to the ground and begins to scream that he itches terribly. Seeing King Koopa desperately scratching himself, Princess Toadstool and Butterfingers realize that Sheldon hadn't joined King Koopa after all and that Sheldon had doused King Koopa in Industrial Strength Itching Potion. With King Koopa completely helpless, Princess Toadstool asks Sheldon if he can help cure Mario, Luigi and Toad of their itching problems, which Sheldon agrees to do. Back at the village of Sheldon and Butterfingers, Mario, Luigi and Toad are sprawled out on the ground, having become to exhausted to scratch their itches. Suddenly, Princess Toadstool, Butterfingers and Sheldon appear, with the latter claiming to have an antidote. Removing the cover from a box he is holding, Sheldon reveals that his antidote is nothing more than spaghetti, which Mario, Luigi and Toad grab and begin to devour. As Toad, Mario and Luigi eat the spaghetti, Princess Toadstool asks Sheldon if the spaghetti will really cure Mario, Luigi and Toad of their itches; Sheldon replies to this by saying that it won't, but it will distract Toad, Mario and Luigi to the point that they won't even notice the itches. In the scene where King Koopa trips on a tree root and stumbles into his Birdo minion, his crown noticeably disappears for several scenes. When Mario, Luigi, Princess Toadstool, and Toad are smothered with Koopa Strength Itching Powder on the dangling bridge, Princess Toadstool and Toad are seen scratching in some scenes and completely fine in others (this occurs when the scenes continue to revert back to King Koopa). Although Toad mentions broken bones in the gorge below, none are seen (most likely to make the episode more kid-friendly). As Butterfingers rustles the leaves as she hides in the bushes, "motion" lines can be seen above the bush. When DiC Entertainment had the cover songs removed from its Nintendo-based cartoons, they missed a segment of this episode. Originally, Jungle Love is heard twice: first when Sheldon opens his shop and second when he is mixing a potion for Koopa. In the syndicated run and in Shout! Factory's DVD box set, the second segment to feature the song is replaced by an instrumental version of the song When the Koopas Paint the Town from The Adventures of Super Mario Bros. 3 episode "True Colors", but the first segment still used Jungle Love. The Shyguys of this episode all wear grass skirts and wield spears with two feathers on them, making them look similar to Spear Guys, who would appear later in the game Super Mario World 2: Yoshi's Island six years after this episode was aired. 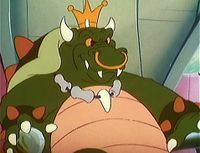 This is one of the three episodes where King Koopa wears a costume, but not an alter ego, the other two being "Mario and the Beanstalk" and "Mario of the Apes".